We will operate here under the assumption that everyone wants the Bills to stay in the area. You don’t have to be a football fan or have a #billsmafia on your Twitter avatar to understand that the Bills are an economic engine, a source of civic pride, and a symbol of good days passed, and hope for the future. Even if I am dismissive of throwing a billion dollars at a game of catch, that doesn’t mean I want Ralph’s post-concussion-syndrome follies to move to Los Angeles. Yesterday, Chris Smith and Brad Riter led the cheer for the $1.4 billion “conversation starter” stadium proposal. If you missed it over at Trending Buffalo, listen here right now. Would that replication of Singapore – a gleaming new Asian Tiger of a Buffalo downtown be great to build on Lake Erie? Sure. Would a new stadium complex that involves the construction of about six bridges, the redevelopment of tainted land, nestled alongside the flour and cereal processors be nice? Sure; that would be great. Would it be fantastic if the Buffalo Bills stayed here in perpetuity, playing in a state-of-the-art stadium? Of course it would. We are, however, in “would be nice” territory, and decidedly removed from “must happen”. And we’re talking about a city that – over 20 years – can’t get it together to expand the Peace Bridge or its plaza, for considerably less money. Even if you argue – as both Brad and Chris do – that a new stadium is the sine qua non – the “must happen” of the Bills’ continued existence in western New York, why does it have to involve everything contained within the Greater Buffalo Sports and Entertainment Center (hereinafter “GBSEC”) proposal? Why are we building a new home for the Jetsons when what we really need is a less crappy stadium with a dome to keep out the weather, and nicer toilets? As much as it makes sense to appeal to fans, you have to also appeal to people who don’t care. We’re a small town with small money. Propose away, but the scale of GBSEC’s proposal is way outside the “reasonable” scale. Brad’s opening premise is that it makes more sense to spend $1.4 billion on a new stadium than $200 million on the Ralph. That’s great, except we’re talking about fantasy-dollars; dollars no one has. First, GBSEC spends several pages’ worth of its presentation creating a whole new downtown, connected to the existing one. We already have a downtown. No one much likes it, and no one much goes there, except for court, the Sabres, and the theater. Would building a sur-downtown have a stimulative effect on the existing one? It would, if the proponents of Mos Eisley-on-the-Lake didn’t factor in the current state of downtown’s ridiculous parking supply into its plan. It doesn’t assume – it doesn’t much allow – our current downtown to change. Much simpler and cheaper would be to let our existing downtown grow organically by giving it a competitive advantage; say, a sales-tax free zone. Secondly, the Bills already have a stadium. I’ve never been in it, so I’ll take Brad’s word for it that it’s really awful. We’re also having a hard time filling it, partly because the team tends to be horrible, but also because of demographics and economics. The region is shrinking. Things like high gas prices take a bite out of people’s discretionary budgets, and it’s harder to add “game” to “food” and “utilities”. We’re having quite the civic discussion over spending $200 million – a teeny drop in the GBSEC bucket – to fix the Ralph up and make it less horrible. Notwithstanding the assumption I propose above, a lot of people would rather see the Bills leave than assign public money to this idea. The Buffalo Bills NFL franchise is worth almost a billion dollars. Its owner is in his 90s, and recently becomes unwell with greater frequency. It’s a hard sell to tell a blue-collar, hardworking, shrinking region that a billion-dollar business needs welfare to help build it a new home. If $200 million is a tough sell, who swoops in and says, “$1.4 billion’ll do the trick!”? Of course, we’re assuming there will be some outlay of public money for this because that’s how these things go. If the state and county don’t play ball, some other city will offer up a much sweeter pot; backyard deers or no. To say “we don’t need a new stadium” is to say “we don’t need the NFL here.” Reasonable position- just know that’s the point you’re making. We talk about the megaregion as being the key to the Bills’ continued viability here, and locating in WNY is geographically the least-inconvenient place. But how much is Rogers going to put up? How much is the Government of Ontario or Canada’s Federal Government going to put up to keep this megaregional asset in WNY? How much is Monroe County going to contribute? What about Niagara County? Why do Erie County taxpayers shoulder such a large fiscal burden for what’s being billed as a multinational attraction? Also, has Toronto really bought into being Bills country? How are tickets selling at the Rogers Centre, another Great Lakes retractable-roof location that had the good fortune to locate itself in an existing urban downtown? Brad and Chris say this all is starting a conversation. But you start conversations by saying, “what if we built them a new, domed stadium in Orchard Park”. Then the conversation may – or may not – progress to, “hey, how about a stadium with a retractable roof on the Outer Harbor. It would cost [insert reasonable, sub-billion-dollar figure here].” Then you expand, and move on to alternate ideas – siting it in Niagara County to be closer to Rochester and Toronto, for example. Perhaps then you suggest coupling the project – wherever it is – with a new, less horrible convention center and maybe a hotel. Even if the project GBSEC proposed had contained only a stadium, hotel, and convention center, it would be something within the world of reason. But you have to convince people of the underlying premise before you throw this whole new city at them. In the podcast, Brad argues that we oughtn’t compare the Bills proposal to what happened in New York and Dallas. Why not? Maybe because the markets are so different, but the dollar figures are quite similar. The new Yankee Stadium, which houses the wealthiest, most successful sports franchise in America, cost $1.5 billion. The new Citi Field in Queens, which hosts the New York Mets, cost $850 million, paid through the sale of New York City bonds, to be repaid by the Mets with interest in lieu of property taxes. The home of two teams – the Jets and Giants – cost $1.6 billion and was the most expensive domestic stadium, ever. So, lets understand that what GBSEC is proposing is on a par with what happened in New York. Dallas? Dallas’ Cowboy Stadium cost $1.4 billion in 2012 dollars. By contrast, Green Bay’s municipally owned Lambeau Field is ancient and was renovated a couple of years ago for less than $300 million. It’s still going strong in a small-town market, mostly because the team is owned by the community. The difference, of course, is that Dallas-Fort Worth and the New York tristate area are already large, interconnected economic regions. The Dallas-Fort Worth Metroplex boasts 6.5 million people across 13 counties. The New York tristate area has about 20 million people within its immediate, contiguous metropolitan area. All of these metros have the added benefit of being located within the same nation-state. Even if one were to make the argument that a billion-plus dollar megaplex on Lake Erie could be a centerpiece to finally recognize the interdependency of a Tor-Buff-Chester metropolitan area, it would be superficial, at best. The fact is that these are neither politically nor geographically contiguous areas, spanning two countries and three major media markets. Even Tor-Buff-Chester itself is a different concept altogether. It’s a megaregion like Boston-New York-Washington, not its own metro. Back in 2007, Richard Florida estimated that the megaregion he defines had about 22 million people in it, strewn across a geography from Quebec City to Syracuse to London, ON. That’s quite a spread. How credible is this plan? Brad and Chris argue that George Hasiotis is a respected businessguy who is well-connected politically. He is. Some point to the fact that GBSEC honcho Nicholas Stracick won a $240 million judgment against Disney, and must be flush with cash. That’s until you realize that he split the money with someone else. After taxes. And after they settled for a much smaller amount from Disney to avoid the verdict going up on appeal. Indeed, Stracick has already recommended that Andrew Cuomo’s billion dollars for Buffalo be spent towards this plan. A $1 billion fund that’s supposed to set the region up for a 21st century economy – should it be spent on an entertainment zone? Why can’t it happen? Anything can happen. Someone could swoop in tomorrow with no backing and a set of nice pictures and propose a building taller than the Burj Khalifa be built on the Outer Harbor. Or maybe a charismatic Iraqi-British con artist could swoop into town to promise to renovate a beloved grande dame of a building, despite having never really developed anything to completion, anywhere. People are skeptical about this because its outlandishness, and Buffalo’s experience, gives people a fundamental right to be suspicious and skeptical. It involves a couple of unknowns who had the cash to commission expensive plans and diagrams. It involves politics and politicians, which means you have to question everyone’s motives ab initio. A $250,000 investment in HKS diagrams isn’t a lot when control over this waterfront property is at stake and being argued about; the NFTA is playing a massive game of keepaway between the city and the state/Canalside. If you like the idea of a waterfront retractable-roof stadium, I’m with you. If you like it being paired with a hotel and a new convention center, I’ll go along with that. But when you basically propose taking the area around General Mills and suggest building a new Shinjuku district, we have a problem. If Citi Field can be built on some of the most expensive real estate in the country for $850 million, I have a hard time believing that it costs almost twice that to build three things on a barren piece of wasteland on Buffalo’s Outer Harbor. Way back in late 2004/early 2005, one of the first Buffalocentric topics about which I decided to write was an NFTA debate that was then brewing over three competing plans for Buffalo’s beleaguered, forgotten Outer Harbor. Eight or so years later, it remains almost equally beleaguered, with some aesthetic and functional improvements in access, but still amounting to grass and weeds. Eight or so years later, the NFTA still controls it, while the Erie Canal Harbor Development Corporation and the City of Buffalo bicker over who should control its development, and the contracts and jobs that go with it. What else have we seen? We’ve seen that while civic debate focuses on extremes, we are capable of reaching compromise when necessary. For instance, attracting a Bass Pro to the waterfront – it wasn’t at all a bad idea. Putting it in the Aud, on the Aud site, or even right up against the water at the foot of Main Street – none of those were per se bad ideas. But Bass Pro isn’t coming, and that, too, is OK. We don’t need it, but it wouldn’t have hurt. On the other side of the argument, we had the armies of preservation demanding green space, no buildings against the water, “authenticity” as defined by them, and now a fetish for defunct grain elevators and warehouses that haven’t been demolished because there is no one to pay to demolish them – haven’t been used because they are economically difficult to justify re-using. In spite of the Fred Kent placemaking sideshow scam, Buffalonians seem pretty happy with the compromise Canalside being built, the Pegula hockeytorium, and the other incremental – but, finally, visible and palpable – improvements being done to the Inner Harbor. So, we look again to the Outer Harbor and we have a new proposal being trial-ballooned whereby we build a billion-and-a-half-dollar stadium for the Buffalo Bills with a retractable roof, a new convention center, a hotel complex, and 5,000 parking spots. Of the silver bullet proposals to come down the road, this is the silveriest, bulletiest of them all. This has a former county comptroller candidate involved in commissioning an epic set of images showing off our newest Elevator to the Moon, complete with a sports museum to be built and run by the people behind Rochester’s Strong Museum of Play. Neighborhoods crumble under the weight of economic decay and desperation, and we have $1.5 billion to spend on playing catch? We struggle to make ends meet with Medicaid funding, heating assistance, and day care for the working poor, and we’ll throw a billion dollars at a hotel and Buffalo Skydome? Is there even a local corporate sponsor who will buy naming rights, or will we just name it after Ralph Wilson, too? Renovating the Ralph is estimated to cost $200 million, which is also a tremendous sum of money for this area, and even that is a deal not yet done. For decades this region has been trampled underfoot by opportunistic politicians with toxic policies, and we have yet to devise an attainable vision for the future and a concomitant plan to get there. But, hey – domed. Stadium. Functionally, the Outer Harbor is a geographical bottleneck – accessible by Skyway or on Route 5 from the South or in from Tifft Blvd from South Buffalo. Three points of entry to get to 5,000 parking spots to service a stadium for 72,000 people. Arithmetically, the people behind this proposal think that the state will pony up $400 million, and that the NFL will provide between $200 to $400 million. That leaves a gap of $700 to $900 million that needs to be filled by private investment and, presumably, county money. That kind of money approaches the county’s entire annual budget. As a practical matter, the soil on the Outer Harbor is toxic and in need of multimillion dollar remediation. But we’re still debating the likelihood that the Bills stay in this region after their owner inevitably passes away in the near future. The team is more than just a sports franchise – it’s a powerful symbol reminding Buffalo that it was once in the major leagues; a legacy we cling to by a thread. Does this area have enough idle money lying around to (a) enable local investors to buy the Bills and keep them here when Wilson dies; and (b) fund a massive stadium project for the Outer Harbor, which would effectively prohibit any other kind of development from happening there? So here we are, with a massive silver bullet pipe dream to try and keep our disappointing football team in town. A shiny object to raise the hopes of the few not yet beaten down by inevitable cynicism; something to occupy hours’ worth of inane AM talk radio chatter, with angry people talking angrily about their anger over money and the crappy team. This has the appearance of being aspirational, but is really evidence of desperation. If we give the Bills this nice new home, maybe they’ll stay. Maybe they’ll stop sucking. On the other hand, we’ll have the self-appointed masters of authenticity decry any proposal involving sports, parking, roadways. We’ll have arguments about how we should spend a billion dollars to improve storefronts on Grant Street, or maybe to spend on more ancillary projects at the Darwin Martin House. We’ll hear how Buffalo is “real” and “authentic” and that this monstrosity does nothing to further enhance our standing as a tertiary stopover on the cultural tourism checklist. We’ll ultimately argue over how many trees and painted Adirondack chairs are available on the grass, whether the water taxi will be able to accommodate gameday crowds, and hey, how about a solar-powered carousel? But let’s cut through all the hype. The people proposing this have two things – a corporate entity and some diagrams. They haven’t talked to the Bills. They haven’t talked to the NFL. They haven’t talked to the State. They haven’t talked to ECHDC. They haven’t talked to the NFTA. They haven’t even taken a survey of the local population to vet the idea of a billion-dollar domed stadium on the Outer Harbor. So far, they’re scheduled only to speak with the City of Buffalo – an entity that has, and would have, no say in the matter whatsoever. We haven’t yet figured out how we’re going to fix up Ralph Wilson Stadium, and we’re already talking about out-Torontoing Toronto’s downtown Rogers Centre. Late last week, two proposals to redevelop the Webster Block – across from the First Niagara Center and Canal Side – were put before the public. Physically similar, the major differences between the two plans is that one includes publicly accessible indoor ice rinks, costs more money, will take longer to build, and relies more heavily on public money. Submitting the two proposals for public vetting and comment, for the use of land the City currently holds, is laudable. However, I will be not at all surprised to see it devolve right into bitter litigation, because of the ease with which that can happen, and stymie the whole project. It’s cost of doing business in our so-called “lighter, cheaper, faster” placemaking/crowdsourcing development culture in contemporary Buffalo. It’s also why our skyline has not changed significantly since the 1960s. First, the Sabres’ proposal. Costing over $123 million, with a promise of 450 permanent jobs, “HarborCenter” is projected to open in mid-2015, include two ice rinks, and rely somewhat heavily on public incentives and subsidies, although the exact figure hasn’t been determined. It features a sports bar, hotel space, retail space, and a 965-space parking garage. Next, here’s a proposal put forth by “Webster Block, LLC”, a joint venture led by Carl Paladino’s Ellicott Development. It features retail space, residential condos, a hotel, office space, and 1,089-space parking garage. Recognizing that design is largely subjective, I somewhat prefer the Paladino proposal. I don’t like the overuse of brick in every new development save the Avant, and these two proposals incorporate that. The archways over the street-level retail in the Paladino plan, along with the awnings and other features one typically sees in big-city urban developments appeal to me. I have seen some criticism about the visibility of the parking ramp in the Paladino proposal, but the Sabres’ renderings seem to conveniently omit that, so Webster Block, LLC gets points for transparency on that point. But the brick-and-windows designs are, to me, so late-80s post-modern. The clean simplicity of the Avant should be a model for contemporary high-rise design in Buffalo. This all looks like an NYU or BU dorm, ca. 1986. Aside from money and the need for subsidies, the major difference here is the Sabres’ inclusion of two rinks. I think it’s a pretty neat idea, especially if there’s non-hockey related just general skate time available to local and visiting families. Adding amateur hockey space to downtown is clearly a positive, and would be a great asset to have to attract league play and tournaments to downtown. But either way, Buffalo wins. This isn’t currently a site, but a blight; another surface parking lot in a city jam-packed with them. It’s the site where the Adelphia Tower was supposed to go – first 40 stories, then 15, then zero as Adelphia went out of business, in disgrace during the last decade. Anticipating complaints about parking – of course you need parking. It’s not the existence of parking that’s bad, but its visibility and use – a surface lot is an utter waste of space, but a parking garage nestled within a larger project and hidden from view is an absolute necessity. Anticipating complaints about the historic nature of the site of some sort, any such complaints would be disingenuous nonsense. No one moaned about historical significance during the decades during which it was a parking lot. Is someone going to complain that it should be a replica of the original Webster Block? A low grouping of brownstone warehouses? Either proposal would enhance the area around the Arena and Canal Side. 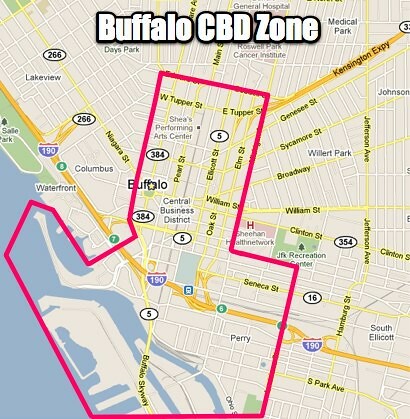 Either proposal would be a net plus for the inner harbor area of downtown Buffalo. Either proposal would be a welcome change from the status quo. We have to get past the mentality where one person can halt civic progress for the public benefit with one lawsuit. I wonder if we’ll get there with this project. If you want to add your two cents, you can email the city at websterblockrfp@city-buffalo.com. When I first started blogging about local issues in mid to late 2004, one of my first topics was the Outer Harbor. At that time, the NFTA was circulating three competing centrally-planned proposals for that land – the parkland proposal, the nice proposal, and what I called the “Elevator to the Moon” proposal, because it seemed to offer everything up to and including that feature. I also called it Amherst-sur-Lac. (Of course, the NFTA picked that plan way back in early 2005. We’re still waiting.) The Buffalo News endorsed it, as well. The biggest problem with the Outer Harbor isn’t land use; it isn’t whether we lay a strip of parkland along the lake, or whether we turn the whole damn thing into little more than a seasonal festival grounds. The biggest problem is how contaminated that area is – and that’s not counting the fact that our self-perpetuating governmental, quasi-governmental, authorities, and public benefit corporations can’t decide who should own the land and control the process. It falls under the ECHDC’s jurisdiction, but is owned largely by the NFTA. Still. I’m not sure why the bus company owns land on the waterfront. Or why it should. Or why it hasn’t divested itself of it yet. Or why it’s sat on it for 50 years. The contamination is longstanding and acute. It makes “what to do with the Outer Harbor” a moot question until millions of dollars are spent to fix it. Ultimately, what’s going to happen is a lot of finger-pointing, a never-ending process of public hearings, public “debate” over how the land should be used, and absolutely zero direction from Mayor Brown. We’ll probably have at least one or two lawsuits, and Donn Esmonde will periodically exit his semi-retirement to scold everybody, invariably supporting whatever group is first to court to seek injunctive relief. We’ll have the NFTA protecting its turf against the city, the state, and the ECHDC. We’ll have loads of renderings, 3D models, and maybe even a fly-through video presentation of what might be built there, but none of it will ever happen. 10 years from now, the Outer Harbor will likely look largely as it does today because the primary goal of all these competing entities and interests is self-aggrandizement and self-perpetuation. It’s going to take initiative and motivation to pull together the money it’s going to take to turn that land into something that won’t poison anyone who spends more than a few hours at a time there, and money is hard to come by nowadays. Ultimately, however, it doesn’t matter whether the NFTA owns the property or someone else does. What ought to happen is that government involvement should be quite limited. A zoning plan with architectural guidelines should be drawn up, streets should be plotted and paved. Utilities should be brought to the properties, and a broker retained to market them. When it comes to projects such as this, Buffalo seems allergic to anything except a centralized plan, but what happens to this potentially valuable property ought to be left almost entirely up to the private sector. As for the parkland demanded by the Citizens for a 21st Century Park on the Outer Harbor, I don’t have any problem with direct waterfront access being preserved for the public, and don’t have a problem with a strip of parkland bordering whatever development takes place and the water. What I would be opposed to is any notion that the entirety of that property be turned into parkland. The Outer Harbor should someday be home to people and retail businesses that support residential city living. Access should be available by boat, car, and the Metro Rail should be extended south to the small boat harbor and Tifft Nature Preserve. This area has been patiently waiting for decades for someone to carefully restore it to a safe and attractive use. Maybe this time we’ll get it right. But I’m not holding my breath.